Mystartpage4.ru is the PUP that uses misleading techniques to prevent removal. Use Reimage to locate malicious components and get rid of them faster than with uninstall instructions. A full system scan blocks virus reappearance and prevents traffic to malicious domains. How can these PUPs hijack my browser? Mystartpage4.ru virus and other its versions, such as Mystartpage5.ru, Mystartpage6.ru, etc., are considered potentially unwanted programs (PUPs) and browser hijackers. These suspicious search engines share almost identical GUI and promise to increase people’s browsing experience. Please, do NOT trust any of these applications! Once any of them infiltrates the system, it adds tracking cookies into user’s web browser, and changes user’s homepage address to Mystartpage4.ru/i/startm.html or similar domain. The indicated URL provides a search engine, which is believed to be untrustworthy. It integrates sponsored links within its search results without even endorsing their content. Sadly, some of those sites can be highly hazardous and provide content that poses a risk to user’s computer. To stay safe and sound, avoid clicking on these search results or using this search tool at all. Otherwise, you might be rerouted to sites that can convince you to compromise your computer without even realizing it. 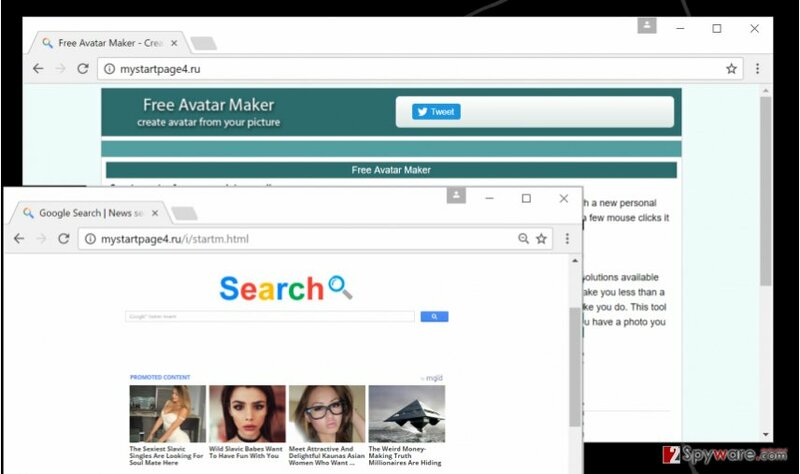 Reportedly, this hijacker or its family members Mystartpage1.ru, Mystartpage3.ru, Mystartpage5.ru and Mystartpage6.ru can land on user’s computer after interacting with Free Avatar Maker app that is presented on mystartpage4.ru. Although it claims to be a useful utility, it seems that its drawbacks exceed its advantages. Rather than providing beneficial features this browser hijacker sets up some tracking technologies and gathers information about user’s browsing habits and his/hers interests to display targeted advertisements. Later on, it integrates the aforementioned third-party links within search results, and displays pop-up, pop-under, interstitial, banner ads. Although it might seem that these ads appear on websites that you visit, they do not come from them. Clicking on these adverts can be highly dangerous for same reasons listed in the first paragraph. It is important to understand that this potentially unwanted program has been created on purpose to serve third-party ads for the user and expect him or her to click on them. To stop this annoying activity, you have to remove Mystartpage4.ru using instructions presented below this article. This can be rather a hard task for those who are not experienced PC users, so in such case, we recommend choosing automatic Mystartpage4.ru removal option. For that, use Reimage or similar software. If your browser has been compromised, then you have to learn how to prevent this from happening in the future. Potentially unwanted programs like Mystartpage4.ru hijack systems easily if users fail to decompose software packs that distribute them. Typically, many free programs like download managers, media players or file format converters suggest installing additional free software alongside them, but it is important to reject these downloads. It can be done after altering the pre-selected installation mode. Therefore, rather than choosing Default or Standard installation settings, you should opt for Custom/Advanced ones and manually deselect all suspicious elements added to your download. After that, installation can be finished in the usual manner. If your computer has been compromised by this suspicious program, do not panic and read these Mystartpage4.ru removal instructions that we have provided. In case this removal tutorial looks understandable to you, delete the discussed computer pest manually. However, if these instructions seem confusing and you would rather opt for an easier removal method, then we suggest you to remove Mystartpage4.ru virus using anti-malware or anti-spyware application. If you have never downloaded such program in your life, we suggest looking at programs that we recommend using. These had been tested by our research team and proved to be useful malware removers. Here, look for Mystartpage4.ru or any other recently installed suspicious programs. Wait until you see Applications folder and look for Mystartpage4.ru or any other suspicious programs on it. Now right click on every of such entries and select Move to Trash. When in the new window, check Delete personal settings and select Reset again to complete Mystartpage4.ru removal. Once these steps are finished, Mystartpage4.ru should be removed from your Microsoft Edge browser. Here, select Mystartpage4.ru and other questionable plugins. Click Remove to delete these entries. Now you will see Reset Firefox to its default state message with Reset Firefox button. Click this button for several times and complete Mystartpage4.ru removal. Here, select Mystartpage4.ru and other malicious plugins and select trash icon to delete these entries. Click Reset to confirm this action and complete Mystartpage4.ru removal. Here, select Extensions and look for Mystartpage4.ru or other suspicious entries. Click on the Uninstall button to get rid each of them. Here, look at the Homepage field. If it was altered by Mystartpage4.ru, remove unwanted link and enter the one that you want to use for your searches. Remember to include the "http://" before typing in the address of the page. Now you will see a detailed dialog window filled with reset options. All of those options are usually checked, but you can specify which of them you want to reset. Click the Reset button to complete Mystartpage4.ru removal process. This entry was posted on 2016-09-18 at 01:31 and is filed under Stealing programs, Viruses. You can quickly scan the QR code with your mobile device and have Mystartpage4.ru virus manual removal instructions right in your pocket. How did you remove Mystartpage4.ru virus?